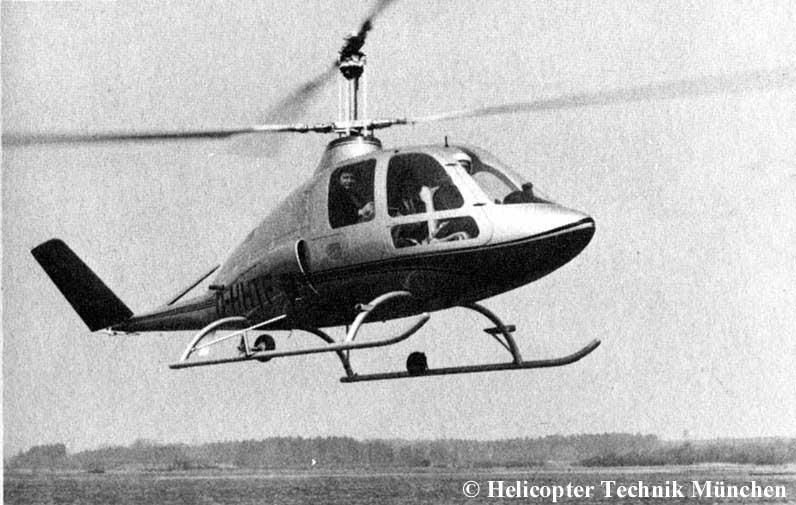 Helicopter Technik München, HTM Skyrider D-HHTF. It was only early 1974, posibly on March 2, a few time before the Hannover Air Show in Germany that the HTM Skyrider did its maiden flight. Here D-HHTF taken during flight before April 1974, carries two normal pasengers but look at the pilot who is wearing a helmet and surely is the test pilot of the machine . It would be interesting to know if, as for the Skytrac, a fan cooler had to be used internally to maintain the Lycoming IO 540 engine at a reasonable temperature during operations.